Type@Cooper Presents: "Moses! Pencils! Excelsior!" David Shields, Associate Professor and Chair of the Department of Graphic Design at Virginia Commonwealth University in Richmond will present a free, public lecture: "Moses! Pencils! Excelsior! 19th (& 20th) century wood type and its impact on typographic norms." Please reserve seats here. Throughout the nineteenth (and early twentieth) century the proliferation of wood type played an integral role in the creation of American visual culture. 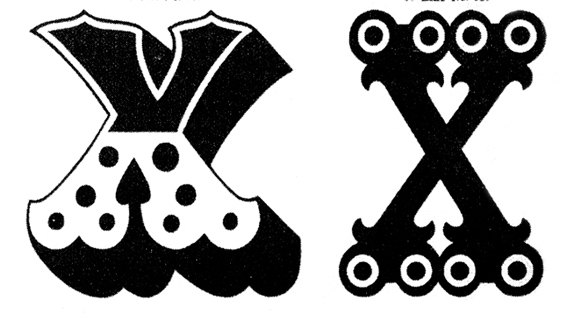 With the introduction in 1827 of innovative manufacturing techniques affording low cost production (and pirating) as well as the proliferation of a wide range of styles and sizes, wood type gave tremendous impetus to job printing and mass advertising. David Sheilds currently focuses his research on 19th century typographic form and visual culture arising from investigations of Rob Roy Kelly American Wood Type Collection. He keeps a slow blog of his research at Wood Type Research. His writing has been published in Slanted Magazine, Printing History, Design Inquiry Journal, and Ultrabold the Journal of the St Bride Library. David’s work has been published in Rethinking Design, AIGA Fifty Books of the Year, Behind the Seen: Studio Dumbar, and has appeared in periodicals including Eye, Emigre, and Print Magazine. His work is also included in the permanent collections of the Cooper Hewitt National Design Museum and Museum of Modern Art. Previously David Sheilds was an Associate Professor of Design at The University of Texas at Austin where he served as the Head of the Design Program and as the Design Custodian for the Rob Roy Kelly American Wood Type Collection. Before joining the UT Faculty in 2004, David lived in Brooklyn, NY, and taught at a number of institutions in the New York region including Rutgers, SVA, Pratt and University of the Arts. He continues to practice as a designer at the studio he co-founded with Jennifer Elsner in Brooklyn in 2000, Viewers Like You, a full-service design studio that provides creative consultancy for graphic and editorial communications and specializes in branding, strategy and positioning of both start-ups and established companies. Shields holds a BFA from Memphis State University and a MFA from Cranbrook Academy of Art.